There is a lot to tell about sustainability. Sustainability is a complicated subject. And there’s a lot to improve in the fashion industry. But also because SKOT wants to go the extra mile to make clothes with a good story. We are on a journey. On our way to 100% sustainable fashion. That means that there is plenty to improve with us as well. But it starts with transparency and full disclosure about the current situation. That is why we like to tell you how we think about sustainability in the clothing industry, and which steps SKOT has taken to offer the most sustainable shirt. If you have any questions or tips after reading, let us know! Send an email to hello@skotfashion.com. Together we can make a difference. Each SKOT shirt is a work of art. All shirts are made in Europe by craftsmen who are proud of their product. They work under safe and fair conditions. We personally visited the factories and we chose suppliers with high labor standards and fair production. We want you to feel good while wearing a SKOT shirt. This is only possible when you know that your shirt is made in the right way. Made by craftsmen in locations where you could work too. 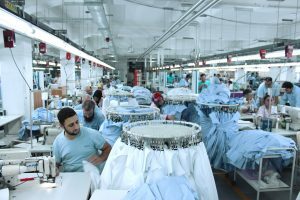 The SKOT shirts are produced in Turkey. Here we found the best mix between quality, fair employment conditions and price. SKOT works with a leading factory in Istanbul, Karbel. This factory specializes in the production of shirts and has high standards for quality and working conditions. Personnel are transported to and from their homes, there is a maximum on the number of hours worked per week and there is a staff council. The factory is BSCI certified. Most clothing in the world is produced in Asia. Mainly in China, India and Bangladesh. SKOT does not manufacture in Asia because of uncertainty about ethical standards and working conditions. Turkey has been negatively in the news about oppression of (press) freedom and minorities, and diplomatic relations with the Netherlands are poor. Should this be a reason to move production to other countries? It is a difficult discussion. So far we have not done it for two reasons. First, the Karbel factory is simply the best. It combines high-quality processes and real craftsmanship with transparency and fair working conditions. Everyone can approach the director and the factory goes the extra mile to support the staff. In our visits we could walk around and talk to everyone. No secrets and no oppression. Second, what do you get elsewhere? Producing in Asia has certain drawbacks. The same applies to Morocco and Ecuador. Portugal and Slovakia have better democracies, but we have not found a facility with satisfactory results in product quality. Sustainability is a journey, and consists of taking small steps to improve. We continue to look for the highest standards in sustainable production, while keeping a keen eye to other important factors such as affordability. We only use fabrics made of 100% organic cotton. We use various producers from Italy and Turkey. The most important sources are Albini from Italy and Soktas from Turkey. Albini is a 5th generation family business based in Albino. They make the most beautiful fabrics for shirts in the world. Albini tries to renew itself in every step in the fabrication of a substance. The last step they have taken is the introduction of a low impact painting facility. Soktas is a specialized designer and producer of fabrics. They also want to get the best results on people, planet and profit. Like SKOT, they opt for a broad approach to improve this at all levels. Soktas is a forerunner in sustainability and offers a wide range of 100% organic cotton. Their Eco Logic Collection is a premium line that combines quality with high durability. SKOT only uses fabrics from certified 100% organic cotton. Where possible, we also look at other sustainable aspects, such as water-saving measures and production near the fabric factory. The production of cotton gets a lot of criticism, because it requires a lot of chemicals and the cotton crop uses a lot of water. As far as the chemicals are concerned, we can be brief: there’s none in the production of organic cotton. With regard to water use, there are many different opinions about the water savings in the cultivation of organic cotton. What does save water is drip irrigation. By spraying the cotton plant at the root, evaporation is prevented and exactly the needed water amount can be given. A conventional shirt requires 3,500 liters of water, with drip irrigation 60% water is saved. This results in a saving of approximately 2,000 liters of water per shirt. That’s the same amount of water you use with showering 50 times! We take great care in selecting the right materials for your shirt. We don’t want to compromise on two important factors in this respect: top quality and sustainable production. Top quality materials ensure that the shirt lasts for a long time. That is sustainable in itself. You can clearly see the difference if you wear a shirt made of extra-long cotton fiber of high quality, without the addition of plastic materials. The fabric feels softer on your skin, and the wearing comfort is higher. The sustainable production simply ensures that many more people can enjoy the production of your shirt. The people who make it and loads of people who also want to enjoy the earth later on. Doesn’t it feel twice as good when you wear a shirt made the right way? We only want to use natural materials in our shirts. No pesticides. No plastic. We use 100% cotton, so that the shirt can be easily recycled to new yarn after use. We only use 100% certified organic cotton for the fabric of our shirts. Without exception. Organic cotton means that no chemicals and pesticides are used during the cultivation of the cotton plant. Why is this important? The chemicals used destroy the agricultural land and are toxic to the farmers. An immense 25% of the total amount of pesticides in the world is used in cotton cultivation. Each non-organic shirt contains an average of 200ml of chemicals. That is a glass full of poisonous rubbish that SKOT likes to leave alone. All the cotton for our fabrics are certified. The best known certification is GOTS. This is a quality mark that ensures that the cotton is produced according to the highest sustainable standards. Did you know that only 1% of the world’s production of cotton is grown organically? SKOT would like this percentage to be much higher. Because it is so low, there is little supply in fabrics and we have to search everywhere for the right cotton. Organic is not only more expensive, it is also more difficult to find. Help us, help yourself and the rest of the world: buy organic cotton! SKOT only uses natural buttons. No plastic. The SKOT Fun collection has brown buttons which give a nice contrast on the shirts. These brown buttons are made from coconut waste. There is a lot of coconut waste, about 60 billion kilos per year. By making buttons of it, the waste can be reused in a clean way. The SKOT Serious collection has beautiful white buttons, made from sustainably grown mother-of-pearl. These exclusive and high-quality buttons are grown and harvested in a sustainable way. A protected reef area in the north of Australia is used for the cultivation of the shells, which contain mother-of-pearl. In the eye season, divers manually choose the right shells for use. They only choose medium sizes. The young shells can grow further and the larger and older shells can ensure the growth of new shells. All our buttons are fastened with a patented method called Ascolite. Under the button the threads are wrapped together, which ensure that the button is firmly secured. This way you never lose a button, and you do not need backup buttons. After all, sustainability starts with reducing. We use conventional polyester yarn. Unfortunately. At the moment, two types of yarn are possible. Recycled yarn and traditional ones. We have tested with recycled yarns, which consist of 30% recycled material. These were not strong enough to use in the sewing machines and to keep the shirt in one piece. That’s why we had no other choice than use standard yarns in most sections of the shirt. Only in the inside of the shirt (overlock stitching) we use the recycled yarn. High quality, and something to gain in terms of sustainability. What is interlining? Shirts have some extra stiffness on the collar and the sleeves. This involves using a substance called interlining. The bad news is that interlining is being glued to the substance with formaldehyde, which is a toxic substance. 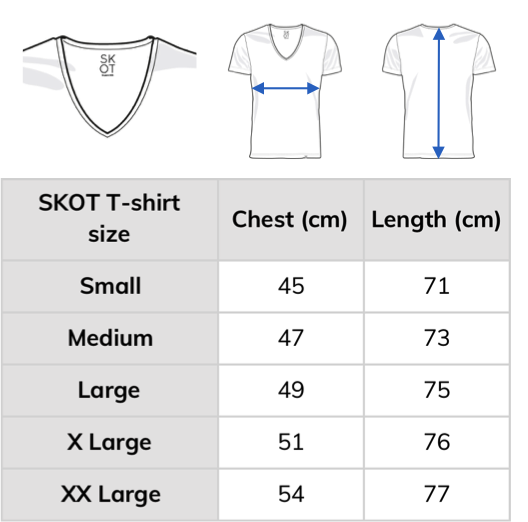 We have used the minimum quantity for our shirts, in terms of classification the SKOT shirts fall in Eco Class 1. This is the lowest level and very safe. This class is mainly used for baby clothes. All labels in the SKOT shirts are woven and made of 100% cotton. Can you make a shirt without labels? We asked ourselves the question during the design phase of the shirt. 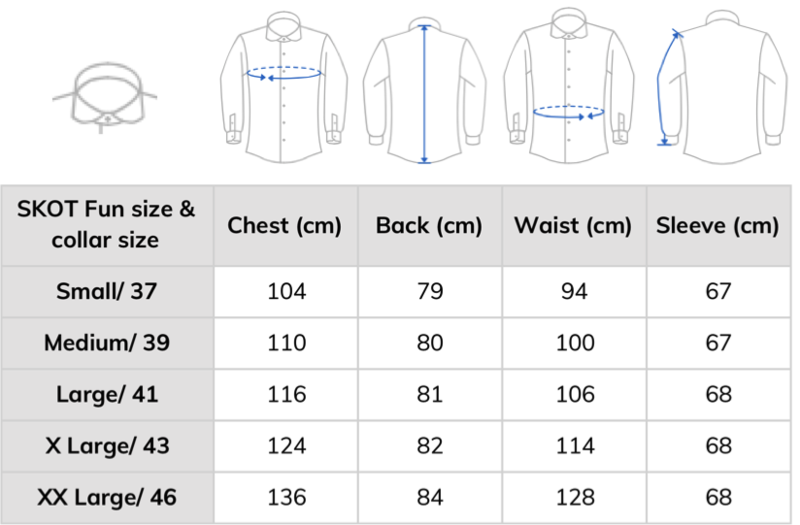 There is some information every shirt should have, such as the size of the shirt, the washing instructions and the country where it was made. We tested with the logo and information directly on the fabric, but the quality was disappointing. So we decided to keep using traditional labels, made of cotton and not of plastic. The next step in the process is to produce these labels with organic cotton as well. 100% sustainable fashion. That is the goal. Return your shirt after use for a premium. It does not matter how long you have worn your shirt. We give you a 10% discount on the purchase of your next shirt. The impact of the clothing industry is currently too large. There are many factors that contribute to the pollution. For example cotton production, water use, painting, transport and the disposal of clothing waste. SKOT wants to move towards clothing with a positive impact. 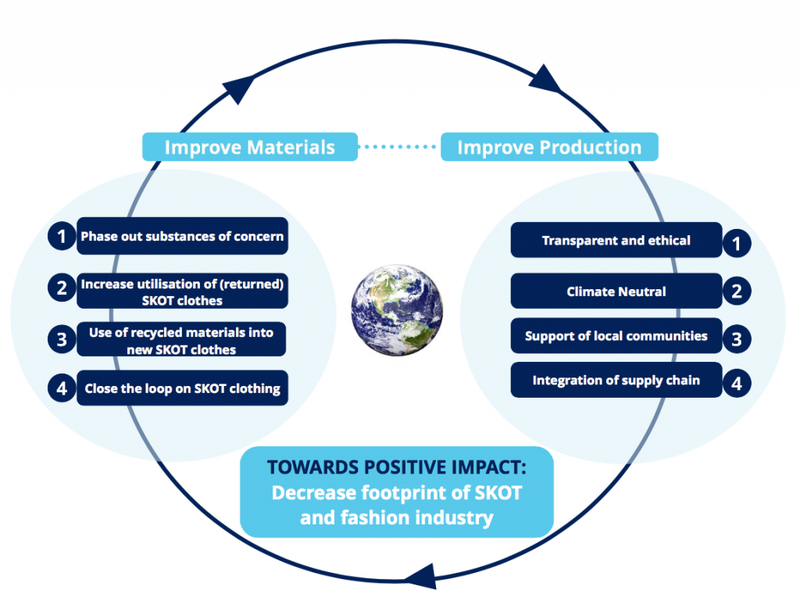 An important step in this is the recycling of existing clothing and recycling more clothing into new fabrics. SKOT uses 100% cotton to make the recycling of fabrics easier. No mix of plastic (elastane) and cotton. We also perform research into the use of other substances, such as Tencel or Refibra. This is fabric partly made out of wood pulp or recycled cotton. We make shirts of high quality because we want them to last a long time. When finally the time comes to put it away, do not throw it away! Send the shirt back to SKOT, and we will reuse the shirt. We also give you a 10% discount on your next purchase! SKOT believes in a fun and fair world. We use the positive power of the fashion industry to create a better world. We make clothes with minimal impact on nature and positive impact on the people who make it. We make sustainable quality affordable. We are on a journey. The goal is 100% sustainable fashion with the best products. Join the Party! The clothing industry is one of the most polluting industries on earth. Pollution occurs at various points in the chain, and it also involves different types of pollution. The footprint of clothing on the earth is too big, both ecologically and socially. SKOT wants to do change that. “A journey of a thousand miles starts with a single step”. Step by step, more information comes available about the state of the clothing industry. The 2017 Ellen McArthur Foundation report on the clothing industry and the Pulse Report of the Global Fashion Agenda are two worthwhile publications. SKOT has done extensive research and also looked at its own possibilities to contribute to a positive impact. This has led to our vision as shown below. SKOT wants to take continuous steps towards positive impact in terms of materials and production. With respect to materials, many results have already been achieved for the first step, the elimination of harmful substances. By using organic cotton, the use of insecticides and pesticides is prevented. The use of formaldehyde is minimal. We want to stop this completely in the future. A minimum amount of plastics is used, we are also looking for alternatives there. The next step is to extend the life of the SKOT fabrics, and then to increase the proportion of recycled material in SKOT shirts. These measures ensure that fewer and fewer raw materials are needed. Ultimately, it should be possible to offer a completely circular product, whose footprint on the earth is minimal. In the field of production, the first step is ethical production. This requires continuous attention. In addition, we want to communicate fully transparently about where and how your SKOT shirt is made. This transparency is of great importance to inform consumers and give them the opportunity to make the right choices. It is hard to see from the outside of a shirt if it’s well made or not. And without extra information you only see the price difference, and the cheap and poorly made product often wins. The next step is to have the production chain operate in a climate-neutral way. This is a huge task, in which the chain has a shared responsibility. It is then the ambition of SKOT to help the people involved in the realization of the shirt with more than just paying a fair wage. Ultimately, the entire production chain can be integrated, so that all parties involved are focused on delivering a fair top quality product. The clothing industry is extremely polluting. At the same time, not many people know that this is the case, and even fewer people know exactly what this means. Let alone know alternatives to solve it. SKOT was founded with these motives. One of the most important things to improve this negativity is to give information. That is why SKOT wants to lead the way in transparency. SKOT is completely transparent about the price elements of a shirt. First, because we have nothing to hide. Secondly, we show that you pay more than double for the same product on main street. At SKOT you get transparency and top quality at a fair price. 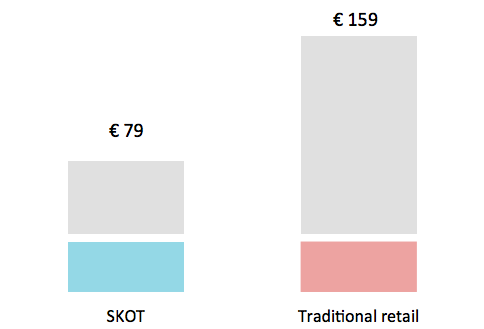 Why is SKOT able to offer a shirt for € 79, while it costs € 159 in traditional retail? It’s pretty simple. SKOT works directly with factories and sells directly online to consumers. In this way we cut unnecessary links from the chain, which increase costs. We put the savings in the product and offer it at a competitive price. Each garment has a certain mark-up. That is the factor by which the purchase price is increased to the selling price for consumers. In traditional retail, this is a factor 5-6. At SKOT we feel a fair price is important, and we use normal margins for our shirts. That is why our factor is 2-3 times. And with that you simply get more shirt for your money! What are the costs of your shirt? We have listed it for you. SKOT looks continuously for the best mix between quality, sustainability and price. And we think we have found the perfect mix. And we are proud to share that with you! Each product contains information which raw materials have been used and where it has been made. This is very normal for food. But very uncommon for clothing. SKOT wants to change that. From 2019, the new SKOT collection will contain a product passport. The shirt is folded with clothespins instead of plastic material or needles. You can easily reuse the clothespins! SKOT wants to publish an impact report each year, in which its own footprint is calculated and in which methods are used to compensate for this footprint.